Eerdmans, 2004, 202 pages, ISBN 0802827845, £14.99. This is a collection of essays dealing with some of the questions that surround ageing. The editors have organised the essays into four sections: the experience of ageing; ethical issues in ageing; caring for older people; and the quest for immortality. The writers are doctors, healthcare professionals, pastors and ethicists. The book opens by offering three distinct perspectives on ageing: retirement, disability, healing and death. There is some analysis of controversial ethical issues which include medical decision making, the moral standing of patients with dementia, healthcare rationing and assisted suicide. There are insightful and practical theological essays on the application of the theology of care to ministry to older adults and through them to others, and on how older people might be helped with death and dying. The book is a model of good practice in the area of practical theology. First there is a quality of theological reflection and an interrogation of culture, learning and experience that form a Christian perspective. 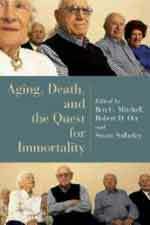 The authors are able to express confidence in what theology has to offer to those involved in the processes of ageing. Second, the volume is inter-disciplinary and there is evidence here to suggest that a variety of professionals from their own expert perspectives have been able to deepen understanding and suggest improvements for practice through shared conversation and dialogue. There is, surely, a need for such inter-disciplinary work where standpoints, assumptions and practices can be challenged and changed. Third, the book is successful in providing a persuasive case for both church and society to re-examine their assumptions and attitudes to ageing. Sooner or later most of us will have to face our own ageing and learn to live within a society that embraces increasing numbers of older people. Within this scenario there are a number of key opportunities and responsibilities for the church in its mission and ministry to older people. This book provides an excellent starting point for some of that work.